Overview - Over the summer of 1976, 36 bombs detonate in the heart of Cleveland while a turf war raged between Irish mobster Danny Greene (Ray Stevenson) and the Italian mafia. Kill The Irishman chronicles Greene’s heroic rise from a tough Cleveland neighborhood to become an enforcer in the local mob. Turning the tables on loan shark Shondor Birns (Christopher Walken) and allying himself with gangster John Nardi (Vincent D’Onofrio), Greene stops taking orders from the Mafia and pursues his own power. Surviving countless assassination attempts from the mob and killing off anyone who went after him in retaliation, Danny Greene’s infamous invincibility and notorious fearlessness eventually led to the collapse of mafia syndicates across the U.S. and also earned him the status of the man the mob couldn’t kill. Throughout film history, some truly great movies have been set in the world of professional crime. Many have even had scripts that were inspired by the exploits of actual criminals. Though there's really no logical reason to romanticize or idealize these rather sordid individuals, in the hands of a good filmmaker, gangster pictures can still achieve an impressive level of depth, insight, excitement, cinematic innovation, and entertainment value. 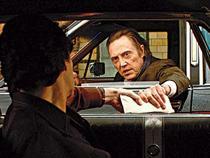 Jonathan Hensleigh's recent effort 'Kill the Irishman' is unfortunately not such a film. Suffering from mediocre scripting, directing, and performances, the end results are disappointingly mundane. Based on true events, the story follows Irish gangster Danny Greene (Ray Stevenson) as he climbs the criminal ladder through Cleveland's corrupt union system in the 1970s. When his ambitions start to interfere with local Italian Mafia interests, Greene becomes the target of several assassination attempts, but killing this Irishman proves to be a surprisingly difficult task. Essentially what we get here is a rough assemblage of pieces from other, much better films. Sequences and plot points strongly echo the likes of 'Goodfellas', 'The Departed', 'Casino', and 'Donnie Brasco'. Considering the material is inspired by actual events, and many tales involving men like Greene hold strong similarities, this comes as no surprise and wouldn’t necessarily be a bad thing. That is of course, if the film was capable of approaching any of its material with at least some level of excitement or ingenuity. By and large though, that simply just isn't the case. Most scenes end up playing like undercooked approximations of sequences and characterizations that have been executed more successfully countless times before. A perfect example of this comes in the form of Val Kilmer's police officer character. He actually narrates the story, but has very little to do with the plot, and ultimately proves to be mostly pointless. His relationship with Greene is just a painful and severely underdeveloped attempt to emulate the type of cat and mouse friendships seen in other films like 'American Gangster'. The script is incredibly by the numbers, essentially guiding us from point A to point B through Greene's life, taking momentary detours at various bullet points. The plot just goes through the motions. We see the man do what he does, but there is rarely any attempt at actual development or depth. When the film does finally make some effort to inject a bit of humanity into the character, it's too little too late. There isn’t much emotional connection to the story and thus there is nothing for the audience to invest in. As written, there's simply no reason why the character of Danny Greene makes a worthy cinematic subject. Very little about the man or his story comes across as gripping or captivating and without any kind of charm or personality, his unsavory actions alone don't make him a very compelling protagonist. The cast is made up of many veterans of the genre including Christopher Walken, Vincent D'Onofrio, Paul Sorvino, and Val Kilmer, but they all seem to be fairly detached from the proceedings. Considering the material they had to work with, I can't really blame them, as there was probably little motivation to even try. Anyone who's seen HBO's 'Rome' knows that Ray Stevenson is a more than capable actor, but here he is mostly lifeless and stale. The direction from Hensleigh is also largely pedestrian, with a purely conventional, point and shoot mentality that rarely adds any visual excitement. In addition, the low budget nature of the picture tends to creep into view with several pretty bad effects sequences that take us out of the story. The opening shot itself, which features a car explosion, is almost laughably bad. On the plus side, once the hit is actually called on Greene, the film does start to display some signs of life. There is something undeniably interesting about the man's knack for constant survival, and watching him escape various explosions and assassination attempts virtually unscathed supplies the movie with its only thrills. Still, these momentary flashes of personality and excitement can't make up for the film's otherwise overwhelming mediocrity. By telling the story of Danny Greene, 'Kill the Irishman' aspires to reach the same heights as previous classics of the gangster genre. Unfortunately, none of the talent involved here rises to the task. Fans of crime dramas might find some entertainment value in the premise, but for most, this probably isn't worth much more than a rental, if even that. 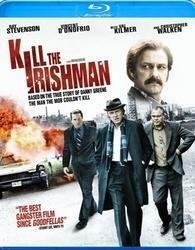 Anchor Bay brings 'Kill the Irishman' to Blu-ray on a single Region A BD-50 disc. Some skippable trailers play upon start up before leading to a standard motion menu with clips from the film. The movie is presented in a 1080p/AVC transfer in the 1.78:1 aspect ratio. Shot digitally in high definition, the results are acceptable but rarely impressive. The source itself is clean, with no major signs of noise, though a few establishing shots seem to come from actual film footage and thus display a bit of natural grain. Detail is good, but certain sequences appear a bit soft. Depth can be strong, however, especially in scenes set outdoors during the day. Colors are slightly muted reinforcing the movie's 1970s setting and contrast is strong but can appear blown out. Blacks are thankfully consistent. On the downside, the high definition resolution makes some of the film's low budget effects painfully obvious. As mentioned before, this is most noticeable in the opening shot of the movie, and then in several other scenes throughout that feature explosions and some pretty weak green screen work. Even ignoring these issues, the movie still has a fairly cheap look to it that sort of drags down the video presentation. While I certainly don't fault the filmmakers for having to deal with a low budget, it just doesn't lead to a very impressive transfer. 'Kill the Irishman' is presented in an English Dolby True HD 5.1 track along with English SDH and Spanish subtitle options. The audio is decent enough, but again demonstrates the movie's budget limitations. Dialogue is clean and easy to understand. Directionality and surround use are OK, but imaging can seem a bit unnatural and forced at times. The effects themselves can also stick out a bit, particularly some unrealistic and exaggerated punching sounds. Dynamic range is a little on the narrow side but there is some decent bass activity, which is good, because the movie does like to blow stuff up. The audio is serviceable, with an occasional sign of life, but this is certainly not demo material. Danny Greene: The Rise and Fall of the Irishman (SD, 1 hr) - Provided in standard definition with Dolby Digital stereo sound and no subtitle options, this documentary on the real life events that inspired the movie, might actually be a bit more interesting than the film itself. Interviews with government agents, retired gangsters, and Greene's family and friends are intercut with archive footage taking us through Greene's life and eventual death. The adaptation seems to follow the real events pretty closely but it's interesting to see the areas that they decided to veer from. Much is made of the fact that Greene's death actually set off a domino effect that helped put an end to organized crime in the area. While not terribly compelling, this doc does provide a more effective look at the man than the main feature does. Trailer (HD) - The movie's trailer is provided in 1080p. 'Kill the Irishman' had some interesting source material to work with, and it does indeed offer a few isolated thrills, but lackluster writing and directing lead to a pretty mediocre film. The video and audio presentations get the job done but reveal the limitations of the movie's modest budget. Supplements are very slim but the included documentary is definitely worth a look. Gangster movie aficionados may want to check this out, but for most this is probably a rental at best.